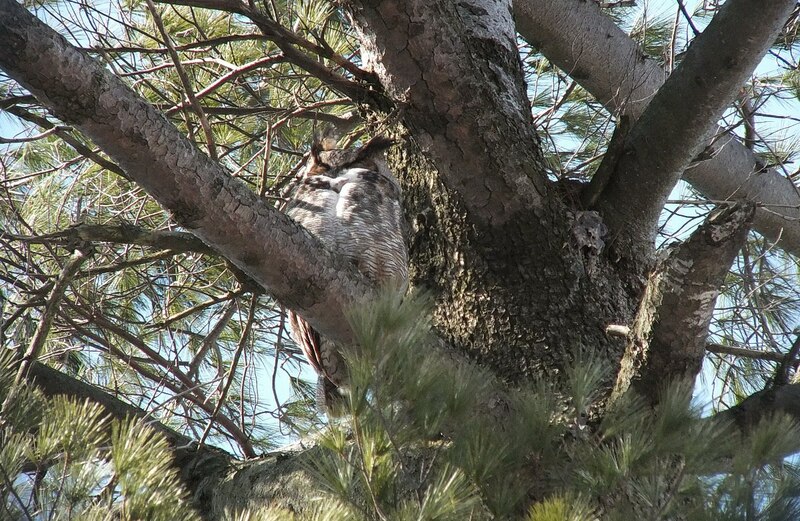 On a lark, Bob and I thought we would revisit Thickson’s Woods in Whitby, Ontario, to see if we could find the Great Horned Owls (Bubo virginianus) that inhabit that forest. 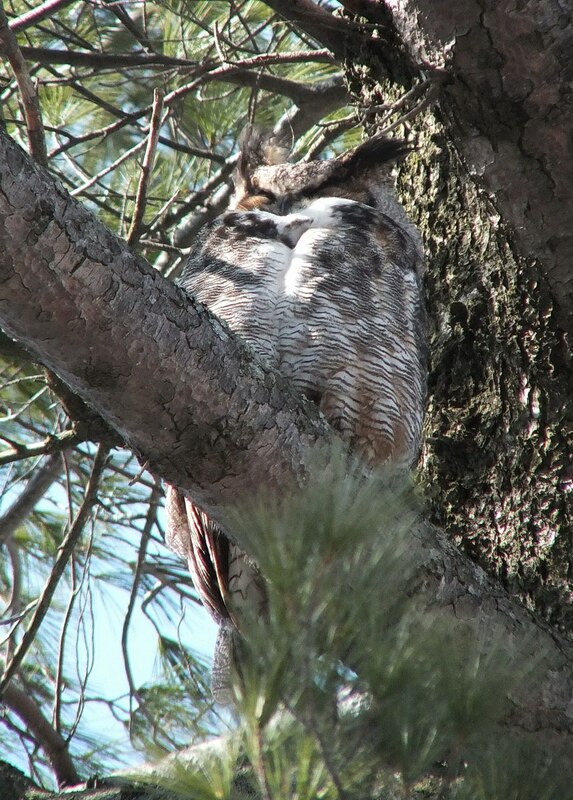 It had been about a year since we earnestly looked for the Owls, and sure enough, one of the beautiful birds was found perched in the top of a tall pine tree. 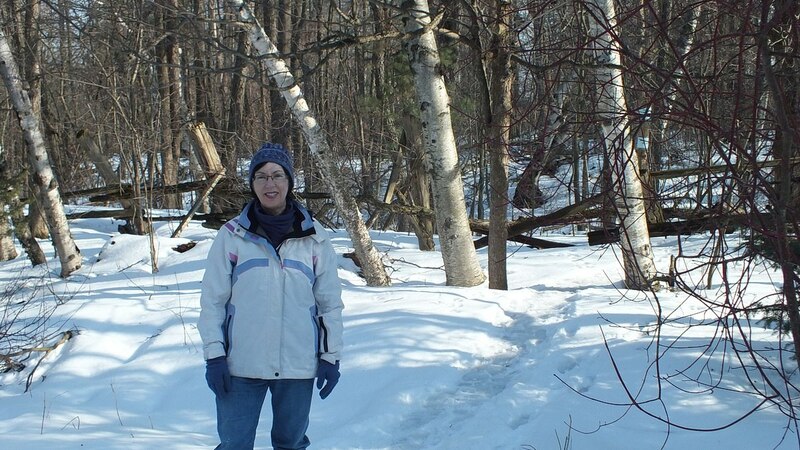 The trails throughout the Woods had been well traveled, and given the warm temperatures of late, the snow-covered pathways were quite soft and slushy. 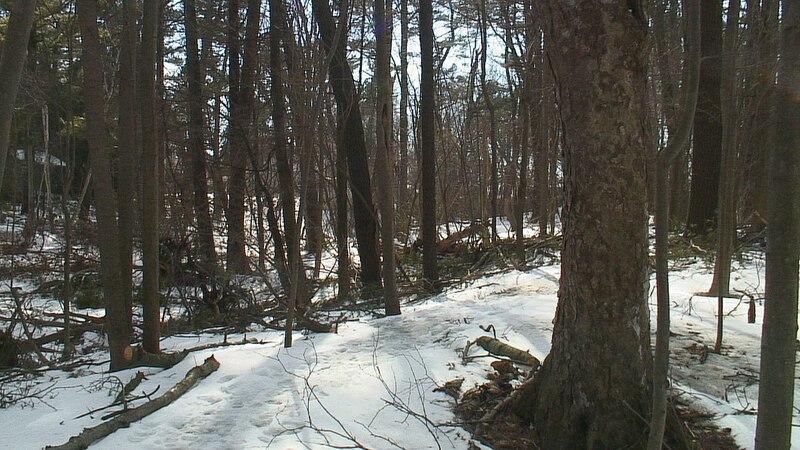 Still, the tracks gave no indication as to the whereabouts of the Owls. 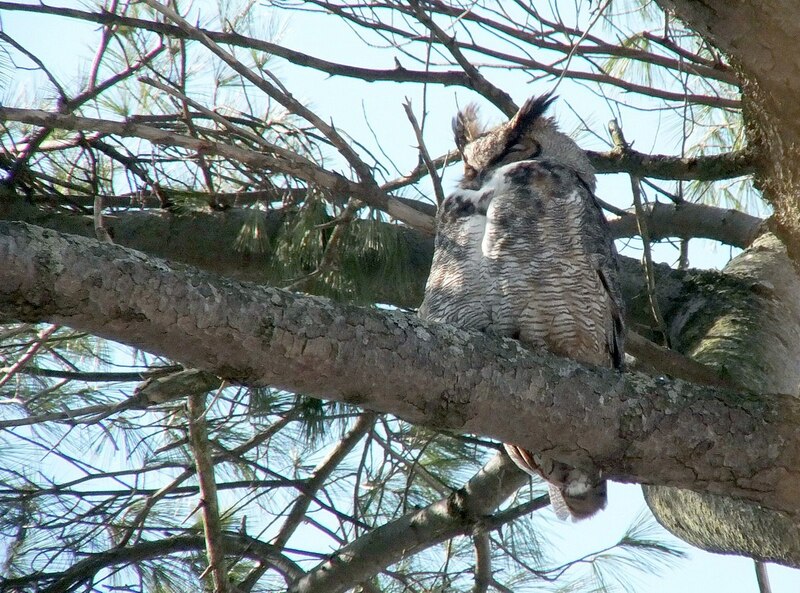 Bob and I first went to the ridge in the forest from which we observed the Great Horned Owls on their nest last year, and the timing was about right for the female to be sitting on her eggs once again. 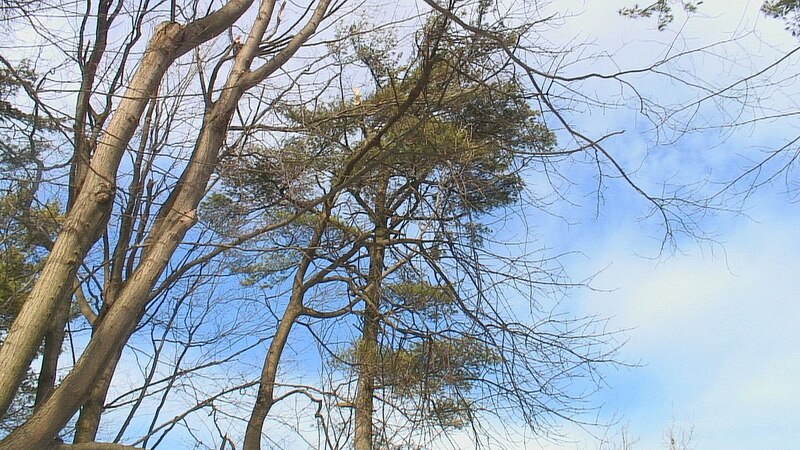 The Pine trees at Thickson’s Woods are old growth so are very tall, and despite moving around the various trails to achieve different viewpoints of a good many trees, we were not able to establish in which tree the Owls have nested this season. 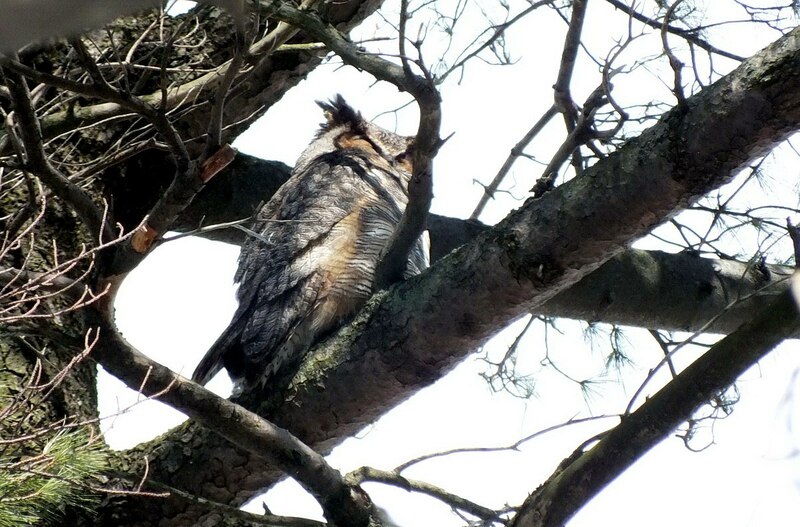 We have been told by a number of birdwatchers who frequent Thickson’s Woods more often than ourselves which pine trees the Great Horned Owls seem to favour. 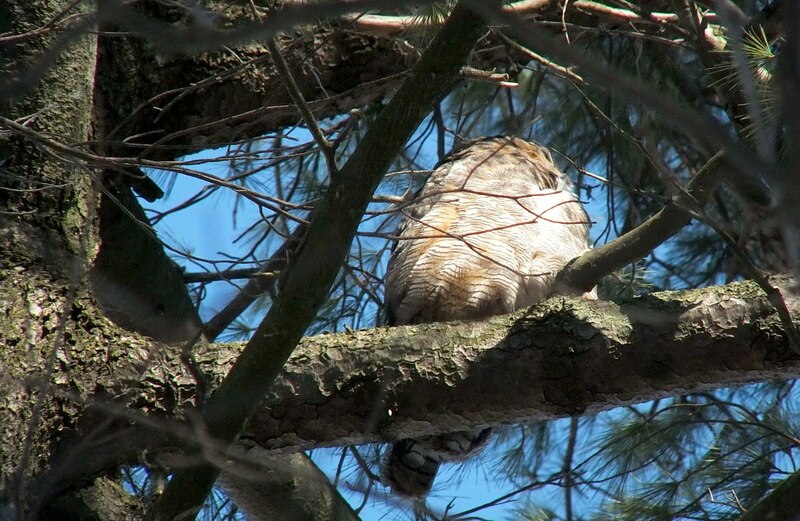 Thanks to their input, Bob was fairly quick in identifying the present perch of one of the Owls. Whenever we have observed the Great Horned Owls, they are not inclined to move from their perch, so we were free to move in a wide circle around the base of the Owl’s chosen tree for different points of view. The light breeze had the pine boughs bobbing, but snippets of sunlight filtered through the dense tree top to illuminate the Owl’s luxurious plumage. 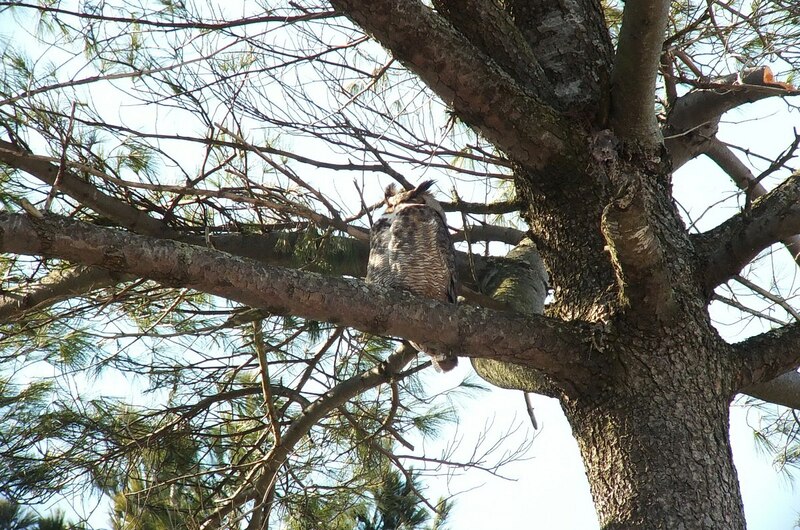 Last year, the male Great Horned Owl chose an observation point within view of their nest tree, and yet this year, of the several pines nearby, none showed signs of a large enough structure suitable for the female and her eggs. As Bob looked up, I looked down, he for the other adult Owl, me for owl pellets beneath many of the pine trees scattered about the forest. Both of us came up dry. 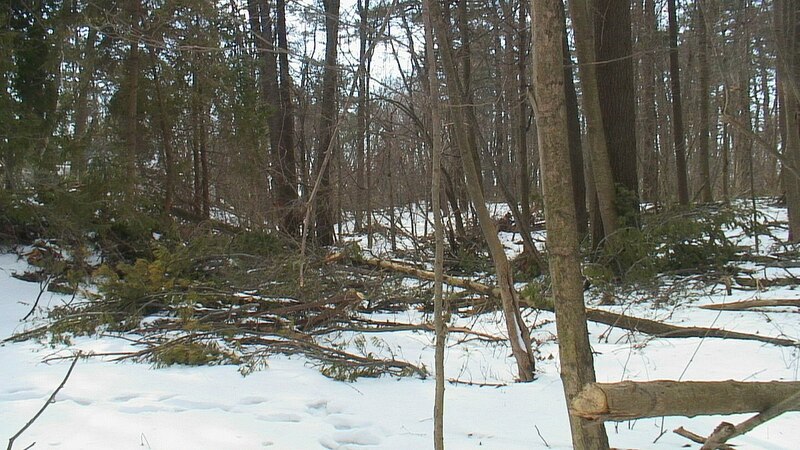 As we moved about the wooded area, we were shocked at the devastation caused to the protected woodland by the ice storm that crippled southern Ontario in December. Some work had been done by local volunteers, I suspect, to clear pathways, but the forest floor was littered with debris, and many widow-makers hung tenuously from branches on high. Even a lot of the century-old pine trees had had large branches ripped from their trunks. 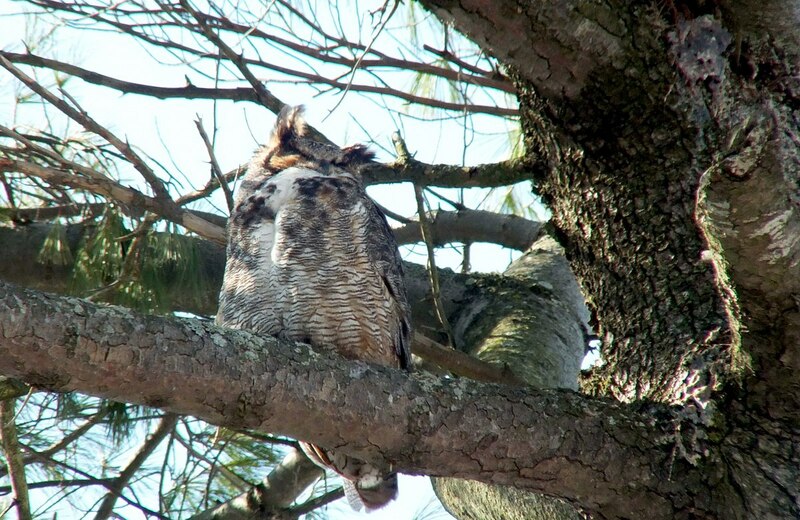 We hope that the thinning of the canopy does not influence the Great Horned Owls to move on to greener pastures. They have been residing in Thickson’s Woods for a good many years. Bob and I took our leave of Thickson’s Woods late in the afternoon, headed to Lynde Shores Conservation Area a little further west. The Great Horned Owl was not budging from its warm spot in the sunshine, at least not until later in the day when it would be time to hunt for some prey. I sure hope there are a couple of chicks to delight us the next time we drop by.